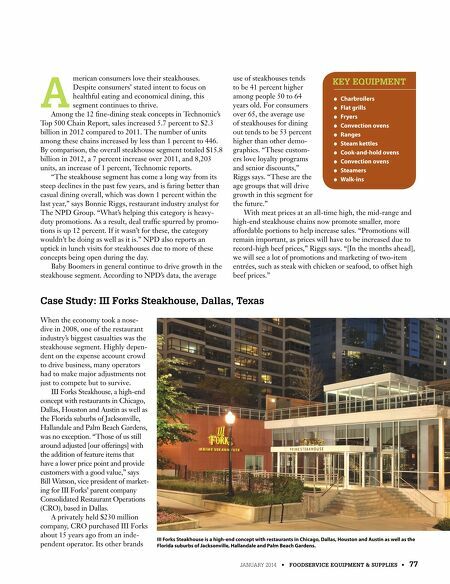 JANUARY 2014 • FOODSERVICE EQUIPMENT & SUPPLIES • 77 A merican consumers love their steakhouses. Despite consumers' stated intent to focus on healthful eating and economical dining, this segment continues to thrive. Among the 12 fne-dining steak concepts in Technomic's Top 500 Chain Report, sales increased 5.7 percent to $2.3 billion in 2012 compared to 2011. The number of units among these chains increased by less than 1 percent to 446. By comparison, the overall steakhouse segment totaled $15.8 billion in 2012, a 7 percent increase over 2011, and 8,203 units, an increase of 1 percent, Technomic reports. "The steakhouse segment has come a long way from its steep declines in the past few years, and is faring better than casual dining overall, which was down 1 percent within the last year," says Bonnie Riggs, restaurant industry analyst for The NPD Group. "What's helping this category is heavy- duty promotions. As a result, deal traffc spurred by promo- tions is up 12 percent. If it wasn't for these, the category wouldn't be doing as well as it is." NPD also reports an uptick in lunch visits for steakhouses due to more of these concepts being open during the day. 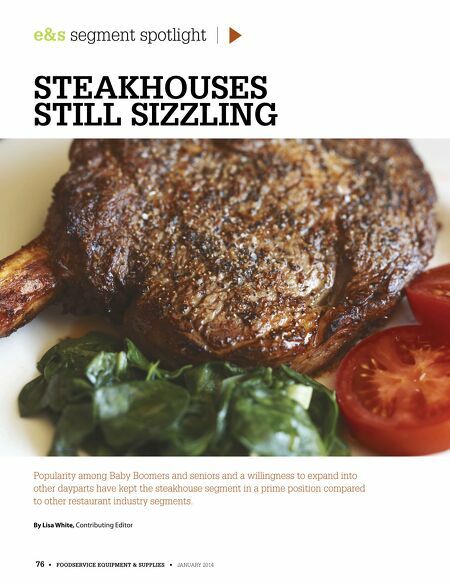 Baby Boomers in general continue to drive growth in the steakhouse segment. According to NPD's data, the average use of steakhouses tends to be 41 percent higher among people 50 to 64 years old. For consumers over 65, the average use of steakhouses for dining out tends to be 53 percent higher than other demo- graphics. "These custom- ers love loyalty programs and senior discounts," Riggs says. "These are the age groups that will drive growth in this segment for the future." With meat prices at an all-time high, the mid-range and high-end steakhouse chains now promote smaller, more affordable portions to help increase sales. "Promotions will remain important, as prices will have to be increased due to record-high beef prices," Riggs says. "[In the months ahead], we will see a lot of promotions and marketing of two-item entrées, such as steak with chicken or seafood, to offset high beef prices." ● ● Charbroilers ● ● Flat grills ● ● Fryers ● ● Convection ovens ● ● Ranges ● ● Steam kettles ● ● Cook-and-hold ovens ● ● Convection ovens ● ● Steamers ● ● Walk-ins KEY EQUIPMENT When the economy took a nose- dive in 2008, one of the restaurant industry's biggest casualties was the steakhouse segment. Highly depen- dent on the expense account crowd to drive business, many operators had to make major adjustments not just to compete but to survive. III Forks Steakhouse, a high-end concept with restaurants in Chicago, Dallas, Houston and Austin as well as the Florida suburbs of Jacksonville, Hallandale and Palm Beach Gardens, was no exception. "Those of us still around adjusted [our offerings] with the addition of feature items that have a lower price point and provide customers with a good value," says Bill Watson, vice president of market- ing for III Forks' parent company Consolidated Restaurant Operations (CRO), based in Dallas. A privately held $230 million company, CRO purchased III Forks about 15 years ago from an inde- pendent operator. Its other brands Case Study: III Forks Steakhouse, Dallas, Texas III Forks Steakhouse is a high-end concept with restaurants in Chicago, Dallas, Houston and Austin as well as the Florida suburbs of Jacksonville, Hallandale and Palm Beach Gardens.